Beautiful 3 bedroom 3 bath, two-story home with a Master suite overlooking Trinidad Bay. Hardwood floors, Anderson windows, double-sliding glass doors on deck, radiant heat, wood stove, all in town, walking distance to beaches, school, shopping, parks and more. Garden spaces, hot tub, a working hand-made pizza oven! Great location with vast views in all directions. Call today for more details. This centrally-located property has it all: wrap-around, south-facing trex decks with double sliding-glass doors; Anderson picture windows with ocean and scenic views on all sides; optional “hosted” income unit; spacious and open floor plan, yard with functioning wood-fire pizza oven and garden beds; close proximity to the services of the quaint fishing village of Trinidad, CA; and access to beautiful beaches, natural harbor, forested trails, and the dramatic Trinidad Head. This home welcomes guests with marine-hued exterior paint, a mature low-maintenance landscape, and a staircase to the entry with south facing windows to capture the warmth of the sun. Multicolored slate floors in the foyer create a generous space to enter the home, transitioning to warm tones of oak flooring throughout the upstairs. Three thermostat stations maintain comfortable temperatures throughout the home. The second floor includes two distinct spaces: the ocean-view Master Suite, which can serve as the optional attached rental space with separate exterior entrance, kitchenette, full bathroom, double sliding glass doors opening up to Trinidad harbor ocean views. Step out and breath in some of the cleanest Pacific Ocean air in the country. Expansive living and dining room, framed with custom anderson windows showcasing the massive Trinidad Head.. The Master Suite enjoys access to the sliders opening tothe expansive, southern-exposure trex decks. Tucked in the warmest, protected corner of the deck is a pub table set. The deck wraps around the south side of the home, creating ample space for guests and ocean viewing. The kitchenette is stocked with mini fridge, a four-top gas range and oven, along with generous counter, wine storage, and cabinet space. The upstairs bathroom has oversized tub with two large rain shower heads, providing a daily “staycation” getaway. The living and dining area looks out through multiple large windows towards the southern and western coastal views. Northern windows open towards the beautiful sitka and alder forests behind town. A wood stove and baseboard heating keep the entire home cozy and comfortable. The full kitchen design include stainless appliances, commercial stainless range hood, natural stone backsplashes, granite countertops, , and maple cabinets. The kitchen’s open design allows chefs to enjoy backyard and Pewatole island views with space for company while cooking. Downstairs spaces include two bedrooms, an additional room for play, office, or den, two full bathrooms, a two-car garage with laundry hookups, as well as access to the back garden and hot tub. The rooms have neutral colored , carpeting with ocean and garden views. The office room has an optional armoire in it to serve as another bedroom. Downstairs south facing bedroom includes a bathroom with stand up shower (which can serve as Master, should the owner choose to use the upstairs Suite as a hosted income opportunity) , while the second, larger bathroom has a tub and hand held shower. Exiting out the garage backdoor, the sizable yard provides an inviting space to unwind, entertain with friends, engage in some gardening, and enjoy the fresh marine air. Just outside the garage, sits a hot tub. Additionally, a hand-crafted, fully-functional, wood-fired pizza oven has been built in the center of the yard. 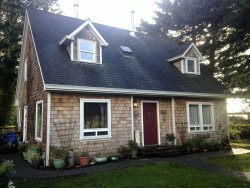 The craftsman who designed a similar oven at the gourmet restaurant, Folie Douce, in Arcata, developed the plans for this home’s smaller version. Several raised garden beds sit adjacent to a row of blueberry shrubs and fruit trees, such as apple, pear, and plum. Mature artichoke plants onsite will provide additional sustenance and landscape interest, as well. A 12-foot by 10-foot shed, complete with deck, pub table set and south-facing window can serve as an extra storage, artist’s space, or the like. This home’s comfort, quality, and location truly translates to paradise living. This sought-after real estate will provide the homeowner with a deep sense of well-being, satisfaction, community spirit, and contentment. Call Joe today to schedule a viewing and make dreams come true! 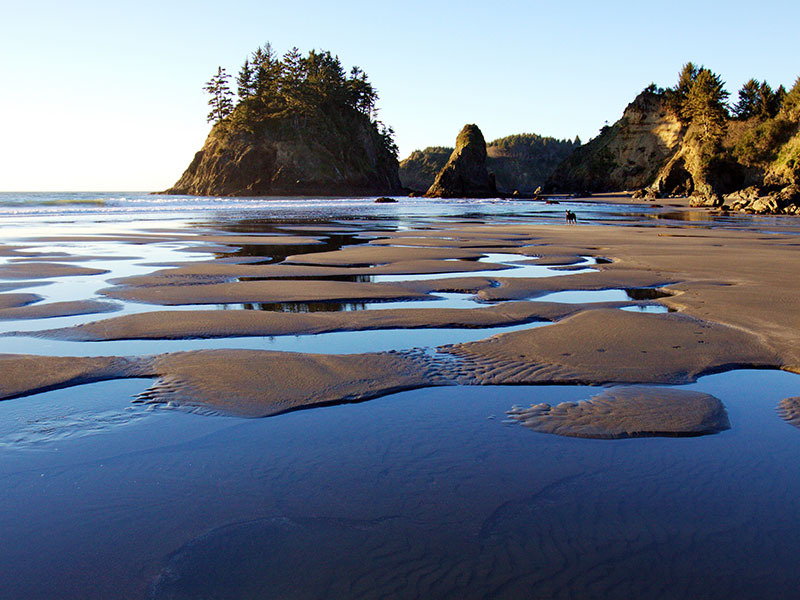 Trinidad is a Gateway Community of the California Coastal National Monument, a treasure of wildlife, scenery, adventure, and nature getaways. Located on a quiet street, this home enjoys the sounds of the waves crashing, sea lions barking in the distance, and the Trinidad Bay buoy bell softly ringing below. Attractions nearby are many. Katie’s Smokehouse sells fresh fish about a block away. The Humboldt State Marine Laboratory with aquarium and touch pool, bayfront seafood restaurant and Trinidad Pier is just down the hill. Restaurants, wine tasting room, spa, school, cafe, art gallery, gift shops, and more, are mere steps from the home. Please let the agent know whether furnishings are desired, as it is priced as unfurnished.